L. Michael Hall, Ph.D. says concerning this manual, “Dr. 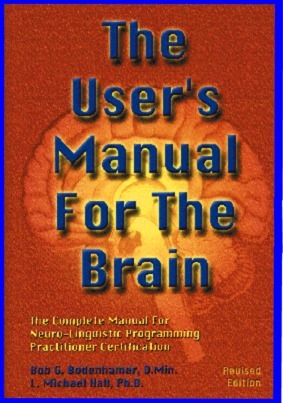 Bob Bodenhamer developed this manual for Running Your Own Brain over a seven year period as he taught NLP for Adult Education at Gaston College and conducted NLP Practitioner Certification training. From those practical contexts, he developed this manual to give people new to NLP a clear and understandable presentation. Here you will find NLP sequentially presented so that each section builds on the previous one. With a mixture of presentation, example, thought experiments, case studies, outlines, metaphors, etc. the manual trains both conscious and unconscious minds. For trainers, overhead mats of the material are available. I (BB) believe that the reader will find within these 400 plus pages the single most understandable and readable treatment of basic NLP available today. Because it has come out of seven years of actual training sessions of NLP, many of your questions will find answers. All techniques have exercises that follow to lead to behaviorial integration of the materials. People respond according to their maps. Mind-and-body inevitably & inescapably affect each other. Individual skills function by developing & sequencing representational system. We respect the person’s model of the world. Person & behavior describe different phenomena. Every behavior has utility and usefulness–in some context. We evaluate behavior & change in terms of context & ecology. The way we communicate affects perception & reception. The meaning of your communication lies in the response you get. The one who sets the frame for the communication controls the communicating. The person with the most flexibility controls things. All communication should increase choice. People make the best choices open to them when they act. As response-able persons, we can run our brains & control our results. So How Does “Hypnosis” Work?